The Elephant Lifting YA ratchet lever hoist has an electro-coated, steel body with an enclosed case, electro-coated components, and a nickel-plated disk hub and feed gear, for strength and resistance to shock, corrosion, and wear. 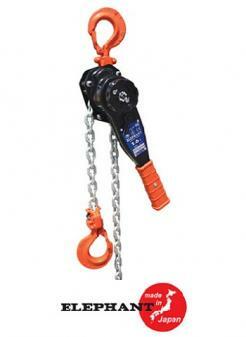 This hoist has a mechanical galvanized grade 105 load chain for high tensile strength and to minimize weight. The mount hook and load hook are drop forged, made of steel, have notched tips, and open slowly to indicate overload. This hoist has a single-action free spooling mechanism with automatic load braking and a rounded lever shape to facilitate operation. It has a Weston-style mechanical friction disk brake with four braking surfaces. The YA ratchet lever hoist is suitable for use in the construction, marine, pulp mill, petroleum, and power industries to lift, lower, and move items, and can be employed for similar purposes in other industries. This hoist is manufactured in Japan. It is load tested by the manufacturer to 125% of rated capacity in accordance with American National Standards Institute/American Society for Mechanical Engineers (ANSI/ASME) requirements and complies with European Conformity (EC) Machinery Directive 89/392/EEC, Annex II A.